When you walk into a room your eye should be able to rest on a particular feature or focal point. In some rooms that’s easy. The big stone fireplace, or a beautiful window with “the” view. Not every room has a distinguishing feature, sooooo that’s where the designer-wanabe in you comes into play. CREATE ONE! Usually a focal point is the place where other furniture revolves or people tend to gravitate. 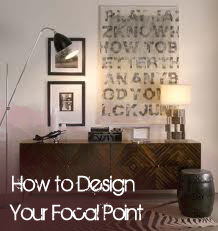 A focal point should draw a person closer. A great area rug could actually be a focal point. Grandma’s old étagère ….I LOVE pieces with a story. A table with interesting objects. A terrific mirror…the list goes on but you get the picture…oh yeah!…artwork can serve as a wonderful focal point. A cool wall display of…..stuff J. You choose. Is your family into music? Old records (those are the round things made out of vinyl J) Sheet music, a ukulele. Plants can be a delightful feature. Even a whopping spider plant. Once you’ve established your feature, consider arranging furniture around or nearby for the best conversation. Remember, that every seat should have a table within easy reach. The importance of creating a focal point is to give visitors a place to congregate without that “okay, I’m here, now what do I do” feeling of awkwardness.